COLUMBUS, Ohio, Dec 06, 2018 (SEND2PRESS NEWSWIRE) -- SafeChain, the industry leader in wire fraud prevention software for land title, announced today that it was honored in the Outstanding Startup category at the 2018 BizTech Awards hosted by regional business publication Columbus Business First. The firm was one of three companies honored in the Outstanding Startup category of the fourth annual BizTech Awards. "Columbus has been an exceptional location to launch SafeChain, and we are truly honored to have been recognized by Columbus Business First amongst the dozens of impressive technology firms in the Columbus area," said Tony Franco, CEO and co-founder of SafeChain. "The level of talent and local support for startups has been instrumental in SafeChain's early success, and we take great pride in our part in making Columbus a growing hub for innovation and entrepreneurship." 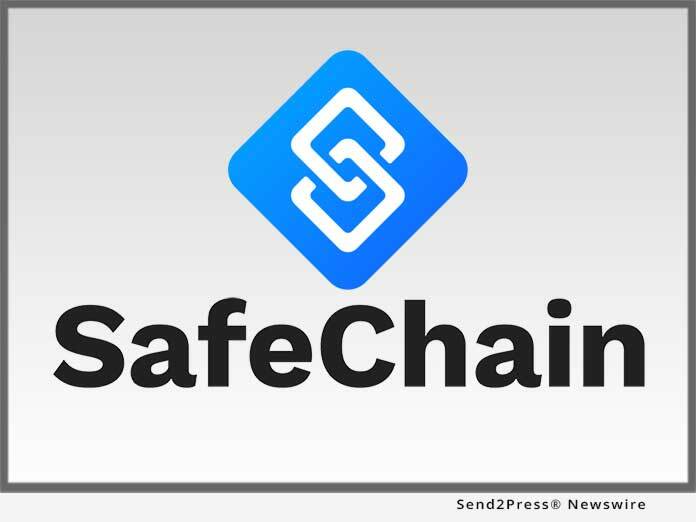 SafeChain was recognized for its wire fraud prevention platform SafeWire(TM) to secure real estate wire transfers, which leverages blockchain technology, as well as its work with the Franklin County Auditor's Office. In addition to helping the Auditor's Office complete the first blockchain-backed real estate transaction in the U.S., SafeChain continues to work the Auditor's Office to modernize the jurisdiction's record keeping by migrating the county's property records to blockchain. "There are so many more applications for blockchain than simply cryptocurrency, and the real estate industry is a prime example of how this technology can improve a process that's nearly as old as the country itself," said SafeChain CTO and Co-Founder Robert Zwink. "Blockchain helps create a more secure and streamlined property transfer process, which enables real estate professionals to be more efficient and fulfill their ultimate purpose, which is to guide buyers and sellers through this highly complex and momentous transaction." Columbus Business First launched the BizTech Awards to keep up the tradition of recognizing promising startups, entrepreneurs and innovations in Columbus. The event has been growing alongside the region's booming tech sector, and according to the publication, this year's award received a record number of nominations and an outstanding group of nominees. To view the honorees of all of the 2018 BizTech Awards categories, visit https://www.bizjournals.com/columbus/biztech-awards. SafeChain makes real estate transactions safer and simpler. Built by real estate title experts in collaboration with banking technologists, SafeChain tackles the inefficiencies of the buying and selling process from the inside-out to help title companies, mortgage bankers and realtors decrease costs and deliver a better experience for customers. Leveraging the most advanced technologies, including blockchain, SafeChain increases the speed and security of closings to deliver faster transactions and better consumer confidence. For more information visit https://www.safechain.io/.